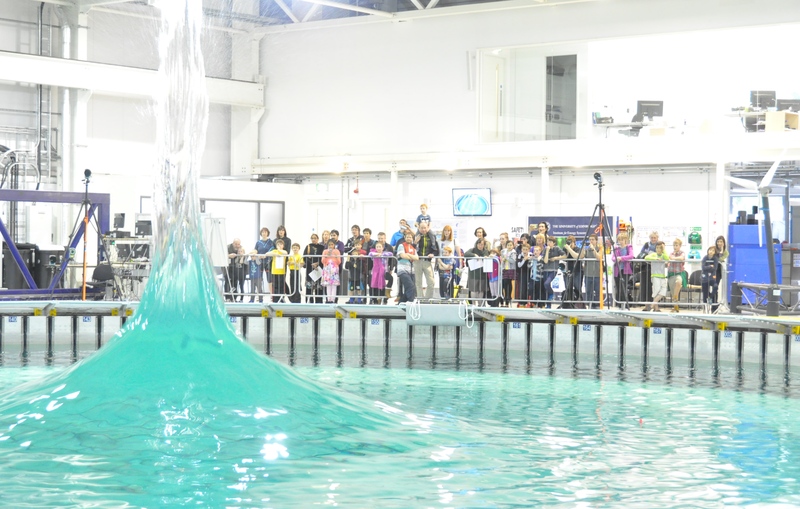 “More than 400 visitors came to see the test facility last year’s Doors Open Day, and we’d hope to improve on that for 2016” says FloWave CEO Stuart Brown. ‘It will be a great opportunity for members of the public to see and learn about some of the research activity and R&D projects we’ve been working on for clients, and of course how we and colleagues from the University’s Institue for Energy Systems can use the facility to help society transition to a planet-friendly low-carbon economy using the almost limitless power of the ocean” he continues. The image left shows one of the circular tank’s impressive party tricks – the ‘spike’. However, with volunteers from the FloWave team on hand, visitors will also be able to understand a little more of the operations at the facility and how our research helps scientists and developers better understand and harness the power of the ocean. In particular how the tank generates both fast currents and complex waves, and can combine these together to establish a fully controllable and realistic simulation of the real ocean in all its complexity. The event is open to visitors of all ages and we are particularly keen to welcome families with children as well as those of a more technical background interested to understand how this world leading research facility was designed and performs. Please also note that for this 2016 running of Doors Open Day the FloWave tank will be in ‘maintenance downtime’ mode. This means we will not be making waves or running currents the tank on the day, but we will have video and staff on hand to explain the scientific background and commercial application of the facility. Doors will be open from 10am to 4pm on Saturday.